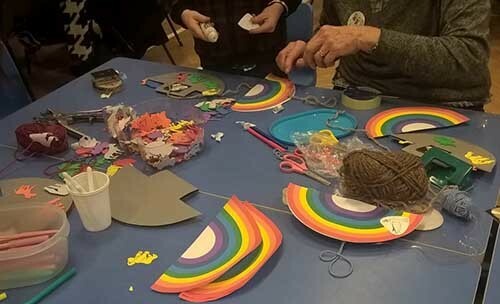 Family Fun is a monthly activity based service, usually on a Sunday afternoon, for all children up to the age of 12 years, and their parents​, grandparents​ and carers. 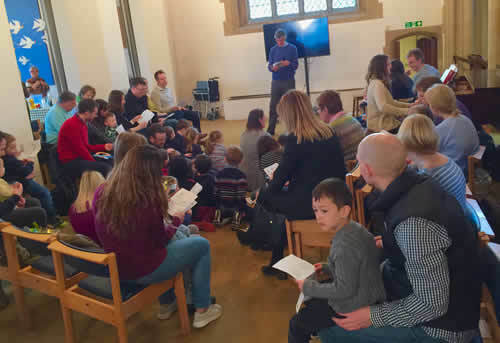 We start at 3pm in the All Saints' church halls with ​lots of ​time for activities and crafts based around ​the Bible, ​which the children do with their parents and carers, ​followed by plenty of ​lively ​singing​ and a story. We end our time together​ with a tasty snack and refreshments for all. Children take home everything they have made. 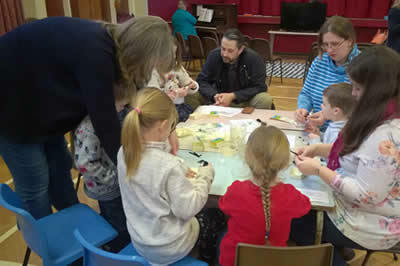 At Family Fun in February and March we learnt about some of the parables that Jesus told. In February we learnt how Jesus told stories about growing our faith, with the story of the sower and the seed; we planted seeds, created pictures with seeds, decorated cakes to look like gardens, and watched balloons grow when they were placed over a bottle with yeast in! In March we learnt how Jesus taught that when we are lost to God he celebrates when he finds us again. We hunted for lost sheep and coins; made sheep to hide in little boxes and made more cakes with a hidden pearl inside. We always finish with a story, songs and prayers and sometimes a video. Then there is a lovely tea to all enjoy together. We look forward to welcoming you​ to Family Fun. If you have any questions, please email ​children@sanderstead-parish.org.uk. Family Fun in 2019 will be on Sundays 20th Jan, 10th February, 10th March, 12th May, 23rd June and 14th July. In April there will be a special family service for Good Friday at 9.30 - 10.15 am on 19th April. Another exciting Summer Holiday Club for children aged 5 -11, takes place on 28th - 30th August 2019. This year's theme is Space. Explore the world and the universe. Visit our Space Academy Page for all the details and booking forms. For more information contact us on children@sanderstead-parish.org.uk. Jigsaw is Sunday School for primary school aged children. Join us at All Saints on 1st, 2nd and 3rd Sundays of the month at 10 am. The Children's Area at All Saints is located in St Catherine’s Aisle, which is part of the main church. There are toys, books, games and puzzles suitable for babies and older children and a member of our congregation, who has been D & B checked, stays in the Area throughout the service to look after and ensure the safety of the children. Parents are welcome to stay with their children or to come and go during the service. Children can take toys or colouring books from the Children’s Area and sit with their parents if they prefer. There are toilet facilities and a baby changing unit nearby in the vestry. Our lively and popular Toddler Groups meet in All Saints Halls on Tuesday and Friday mornings at 9.30 am in term time. ADVENture 2018 All through Advent a different scene was revealed around the parish. Visit our ADVENTure page to see what happened.